Using a wood preserver helps to protect and preserve decking timbers, posts and supports from mould, algae, fungi, wood rot and insect attack, all of which can degrade untreated wood over time. The two key types of wood preserver are water-based and solvent-based, both of which are available in clear and coloured formulas. Solvent based wood preservatives generally penetrate deeper into the timber and often dry quicker than water-based formulas. Water-based preservatives are far less smelly to work with and are less harmful to the user and environment. Although solvent-based formulas have traditionally been used for exterior wood care, changes in legislation regarding high VOC’s (Volatile Organic Compounds) means that many traditional solvent-based wood preservers are being phased out and replaced with water-based versions. Most brands of Wood preservative are generally available in both clear and coloured formulations. This means that decking can be treated but kept looking natural or coloured during the preserving process. Using a wood preservative as a stand alone treatment will keep wood protected from biological threats but is not sufficient or durable enough as a standalone treatment. 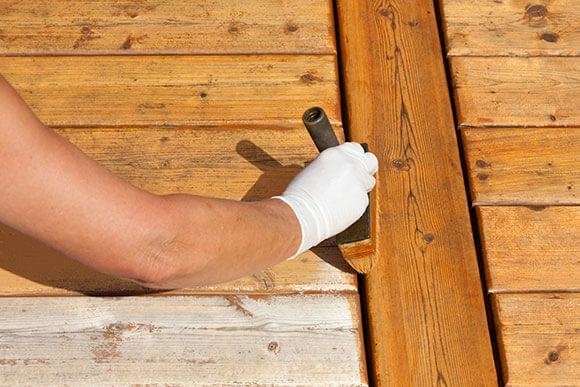 For this reason, when using wood preservative on decking, always overcoat with a suitable decking treatment. For the best protection preserve all or as many of the timber components as possible with two coats of wood preservative. This should include both sides, edges and especially the end grain or sawn ends of the timber. The same should then be done with a suitable decking oil or decking stain or decking paint after the preservative has fully dried. This will help to protect these areas and especially sawn ends from moisture and water ingress. If planning on painting or using a varnish type decking stain, its worth remembering that some decking preservers contain wax. Although this is fine if over-coating with a solvent-based decking oil, the wax content will prevent water-based decking oils, paints and varnish type stains from adhering to the wood. This could result in the finish flaking off. For complete care and maintenance of garden decking, read more on decking cleaners, decking stains, decking paints and decking oils.